Practicing feng shui is a great way to bring relaxation and tranquility to your home or office. It can increase the flow of your positive energy, known as chi. The literal translation of the words “feng shui” is “wind-water.” In feng shui, the five elements – wood, fire, earth, metal, and water – and the use of them in your home or office are very important. Balancing the five elements in an environment can bring about positive chi energy, but when the elements are out of balance, you experience negative chi energy. How can you rebalance your energy? By making sure each element is represented in your surroundings. The flow of water can be calming and relaxing, but what if you don’t live by a lake or ocean? How can you incorporate the element of water in your home or office? The best way to make sure water is represented in your home or office is through the use of a water fountain. Over the past several years, feng shui has become very popular, so when you are out shopping, you are probably seeing more water fountains for sale. There are fountains that mount on the wall, sit on your desk, and outdoor fountains. What type of fountain should you choose? Choose a fountain that you like, one that makes you feel peaceful just by looking at it. If this is your first water fountain, you might want to choose a small desktop fountain that is easy to clean and maintain. Make sure it is not battery powered, as leaving that one constantly will eat up many batteries. The motor should be silent so you can hear the water flowing, which adds to your relaxation. The best places in the home or office for your water fountain based on a baqua map are the health and balance section (east), the abundance section (southeast), and the career and life path (north). You can place a water fountain inside your front door to the left to help deflect negative energy as well as bring you good luck. Are there any areas in which you should not place a water fountain? Avoid the south, which is related to your reputation. That is because the element of this area is fire and combining water in an area which is represented by fire can cause conflict. You should also avoid putting a water fountain in the bedroom. In this particular area, the water can bring worry – something you don’t want in your bedroom. Many fountains have slates or steps where you can add additional items. To attract additional positive energy, place small crystals, candles, and mirrors in your fountain. Adding a red item such as a rose quartz to your water fountain can help bring in additional harmony and joy. Green plants are another good thing to add to your water fountain, as they encourage growth and serenity. Plants can also bring new chi into the surroundings while helping existing chi flow easier. Bamboo flutes are thought to promote growth, stability, and provide protection, so consider adding bamboo flutes to your water fountain as well. 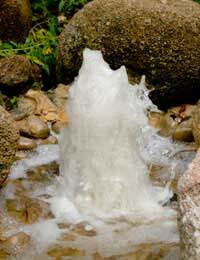 Adding items to the water fountain is a good idea, but don’t overload the fountain – clutter represses the flow of energy. Adding a water fountain to your home or office can help stagnant chi start flowing again. This positive energy can create a relaxed state while the sound of the water flowing can help calm your nerves and reduce stress.